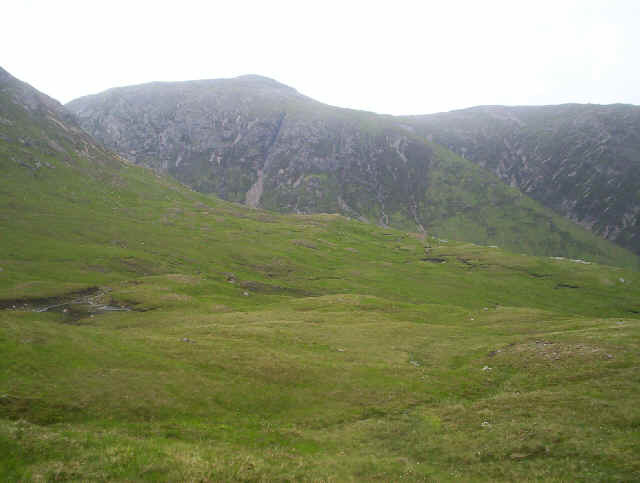 The objective of this day's walk, in May 2007, was Stob a'Chore Odhair and, possibly, Stob Ghabhar. 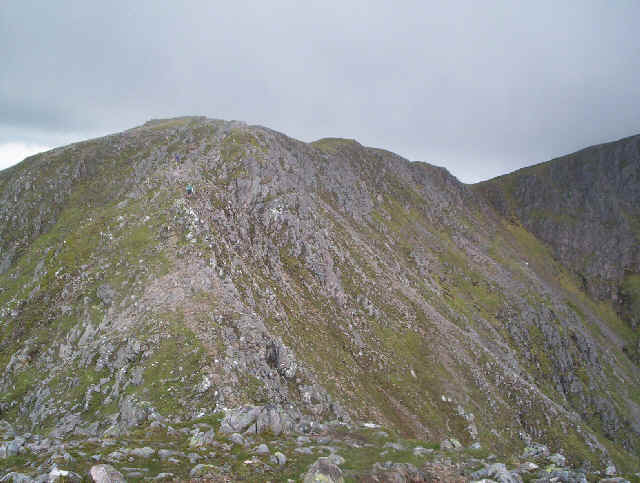 I wasn't too sure whether I really wanted to go on to Stob Ghabhar as the "other" Aonach Eagach ridge sounded a little hairy; I haven't got a good head for heights especially when exposure is on both sides. The day started with the Citylink bus from Tyndrum to Bridge of Orchy, leaving there at 9.00 a.m. 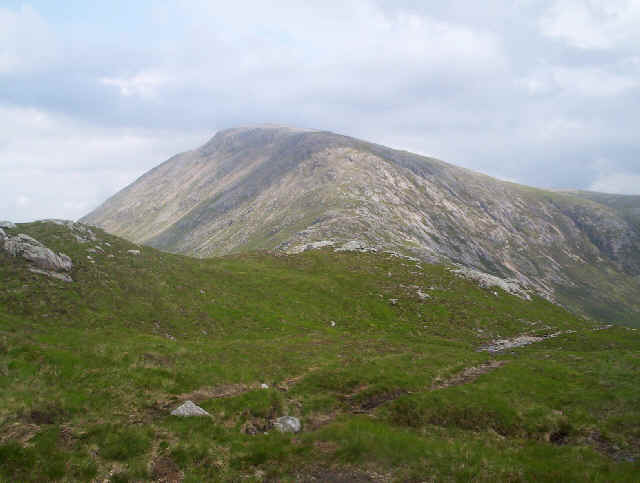 Given that I had a long walk ahead of me I decided to "yomp it" along the road to Victoria Bridge, rather than taking the West Highland Way path over Mam Carraigh; there'd be enough ascent for one day later on. 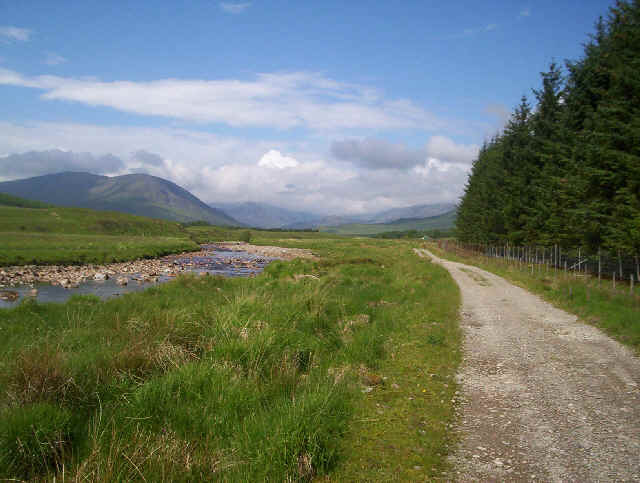 Leaving Bridge of Orchy by the river. 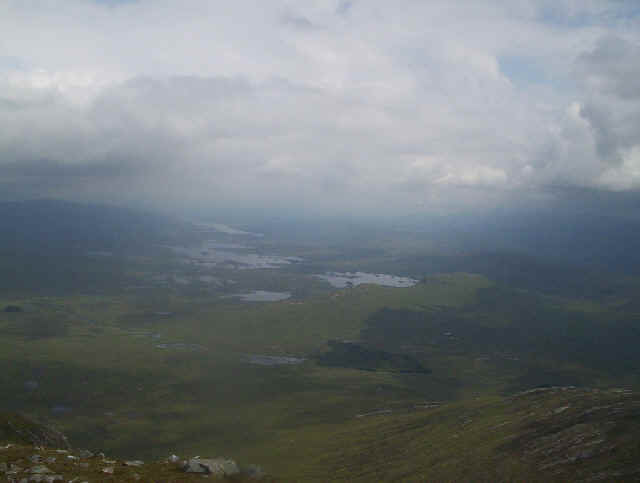 The end of Loch Tulla with Stob Ghabhar appearing through the cloud. Beyond Victoria Bridge the paved road is left as the land-rover track is followed up towards the Clashgour Hut; that's the green hut just visible in the photo. 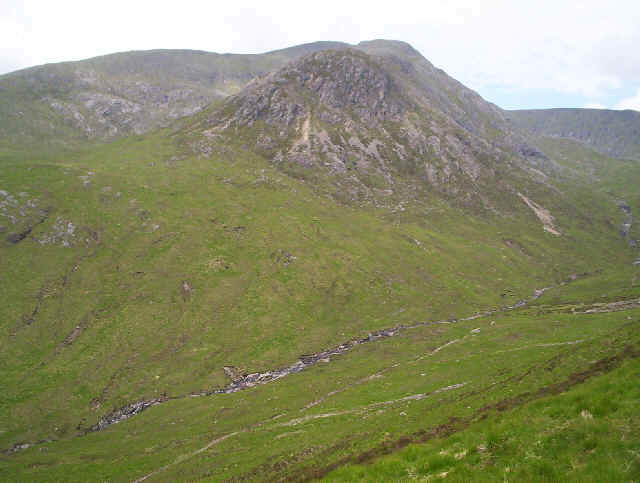 The walk up to Loch Dochard is one we undertook a few years ago and is a super walk for a bad weather, or "rest" day. 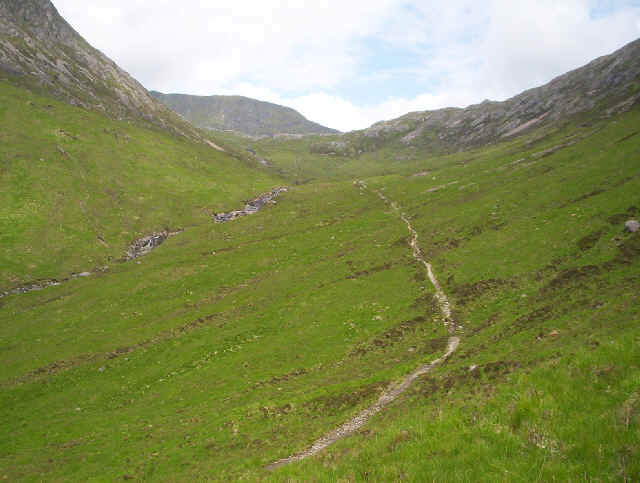 I've just left the path which leads up into Coire Toaig and am heading up a steep zig-zag track towards Stob a'Choire Odhair. 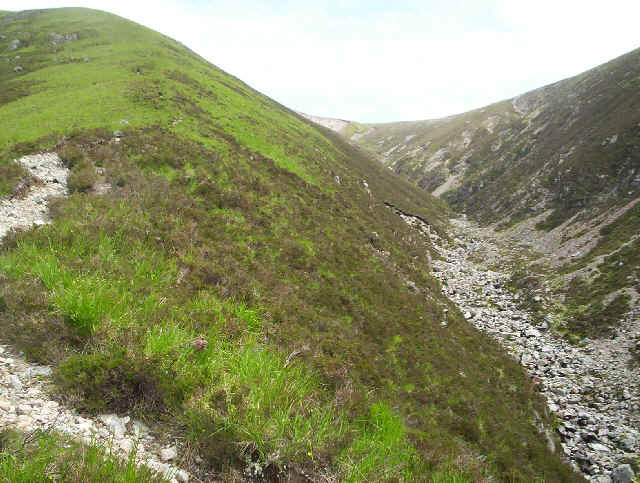 The path climbs up beside the gully of the Allt Caolain Duibh which was completely dry. 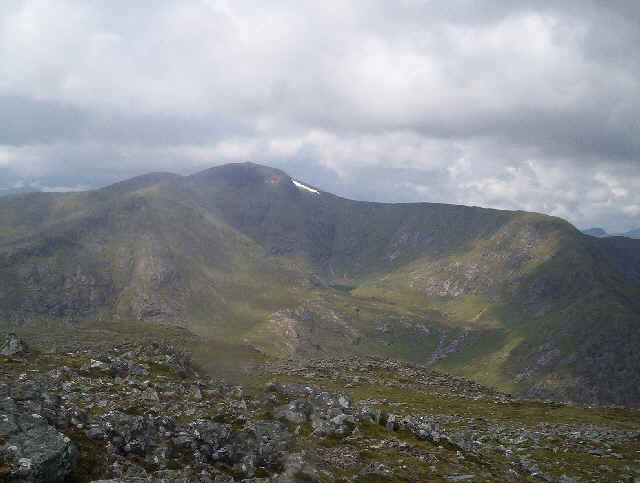 From the path views become increasingly dramatic with Stob Ghabhar's summit on the skyline. Looking back down towards Glen Dochard the route is clearly visible. The summit of Stob a'Choire Odhair isn't particularly inspiring on its approach from the south but the views, even on a slightly hazy lunchtime made up for this. 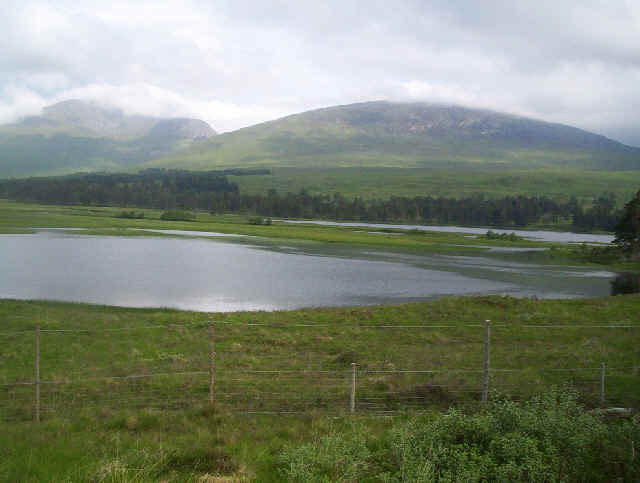 Below stretches Rannoch Moor, or should it be Rannoch Lochs? 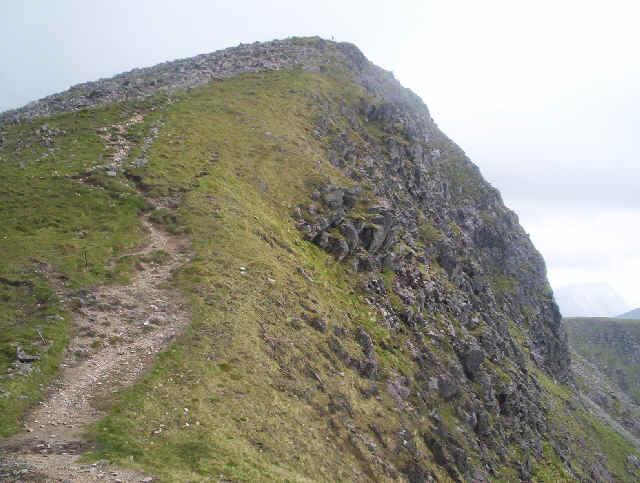 Turning to face the other direction Stob Ghabhar calls. 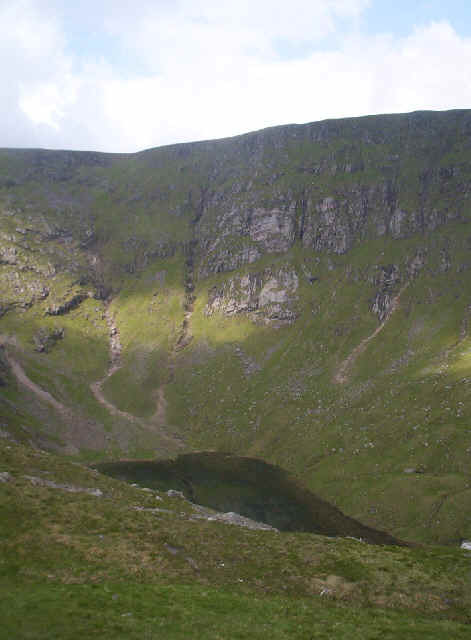 I'd decided by this stage that it was time I conquered my nervousness on arêtes, so I was about to set off when two other walkers appeared, also heading in that direction. I'm afraid I can't remember their names but we spent an interesting hour or so on the next stage of the walk. 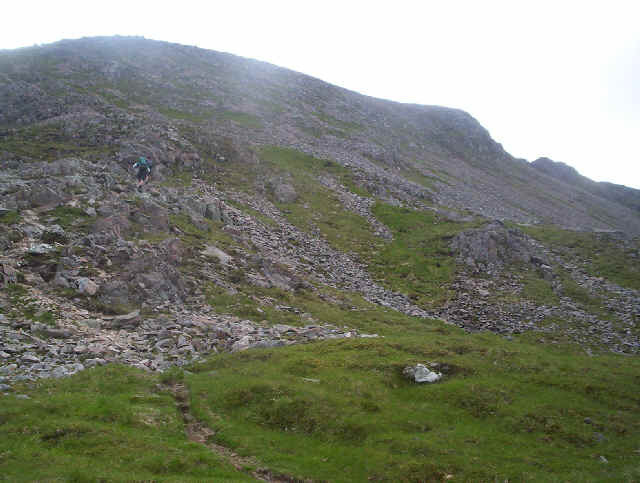 Here I'm heading down to the bealach above Coire Taoig, a nice gentle stroll down easy slopes, with no hint of what is to follow. Even down at the bealach things don't look too bad. OK! it's a long way up. The Coiren Lochain is one of the most dramatic mountain sights I've seen so far; fully equal in grandeur to many places in the Alps. 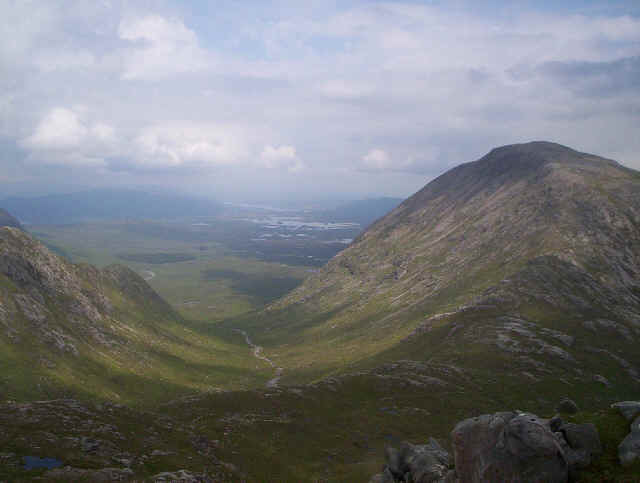 Looking down from just below the ridge towards Rannoch Moor with Stob a'Choire Odhair on the right. 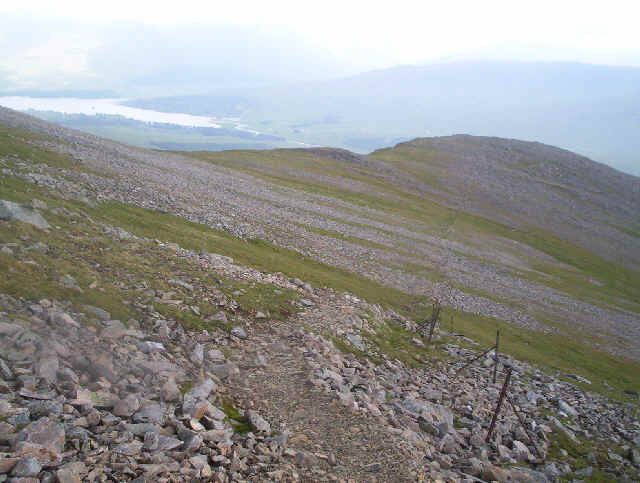 Onwards and upwards - the climb from the bealach to the summit is 442m (1450 feet). 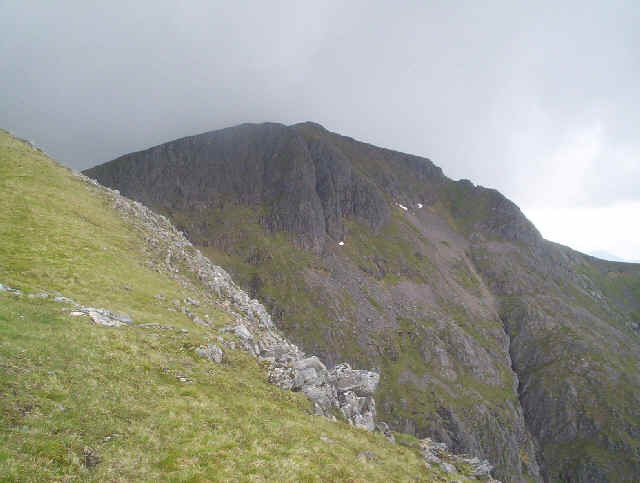 The start of the Aonach Eagach ridge. By now I'd stopped to take so many photos that my two companions were considerably further ahead. This section was exposed but there's a track just to the left of the ridge that avoids the need to walk on the very top. 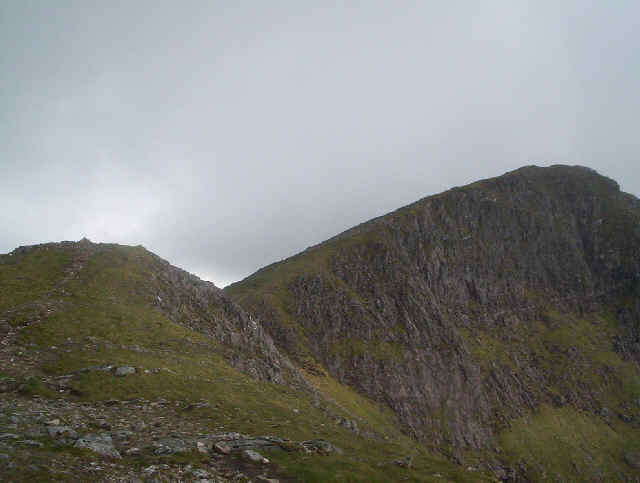 At last most of the hard work is over and the summit is in view. 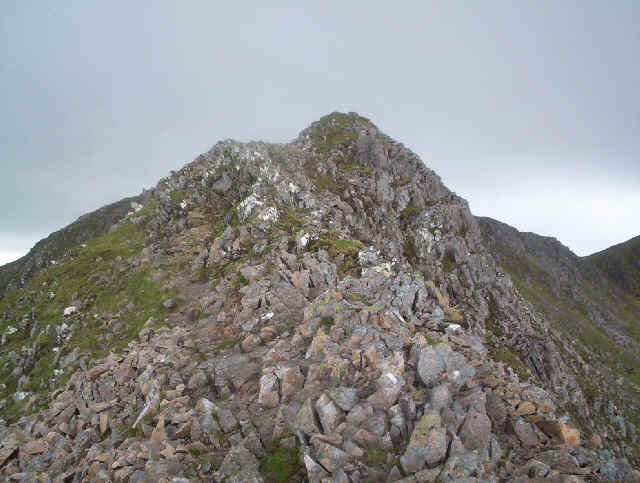 An easy track leads to the summit cairn of Stob Ghabar. 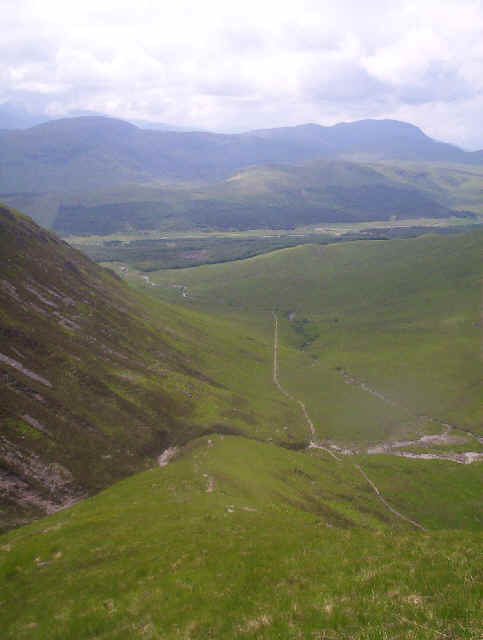 The view down into Coiren Lochain from the summit. 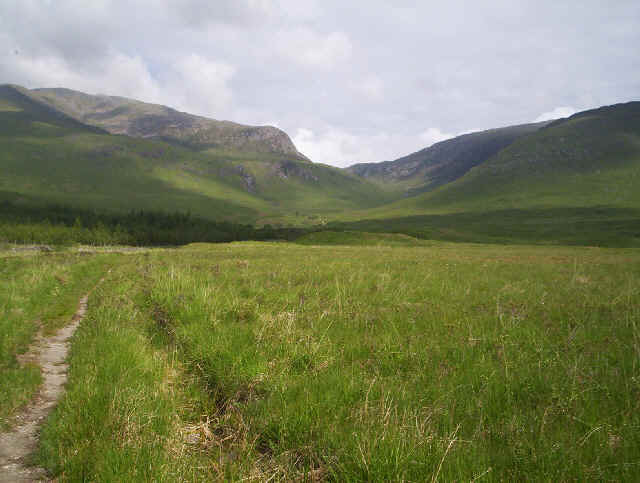 The return to Bridge of Orchy is simply a matter of following a track by some old metal fence posts. 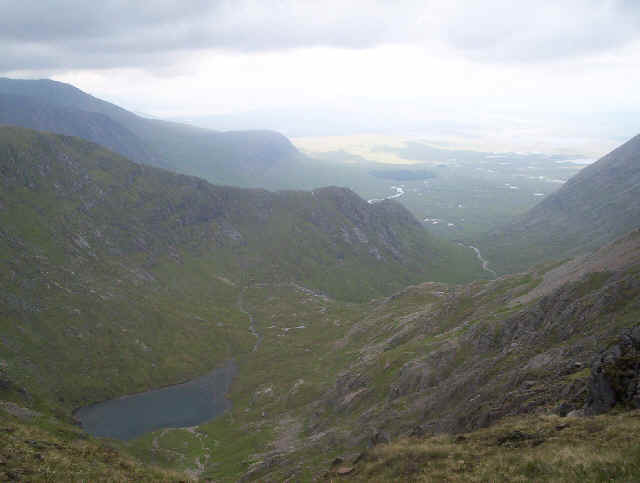 I returned down to the beginning of the ridge and then turned south-eastwards down the track. After the initial stony section the path becomes slightly boggy in places. 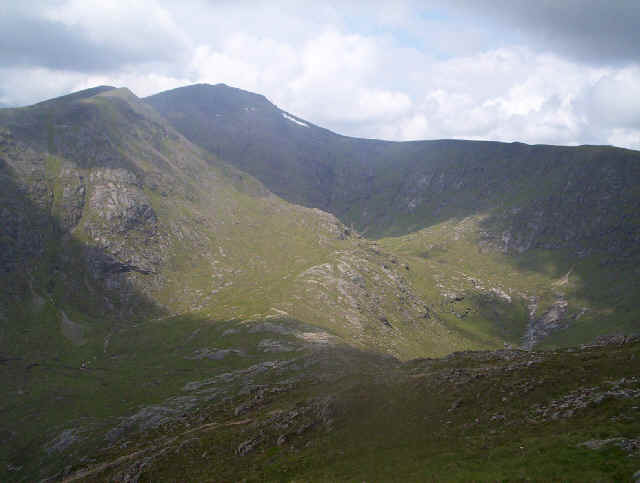 Across the valley can be seen Stob a'Choire Odhair. 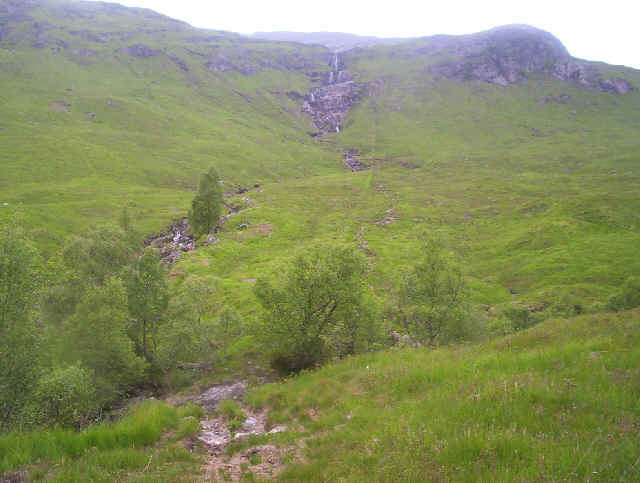 Looking back up the ridge towards a waterfall; the path comes down to the left of the stream before crossing the Allt Toaig and rejoining the outward route back to Victoria Bridge and Bridge of Orchy. 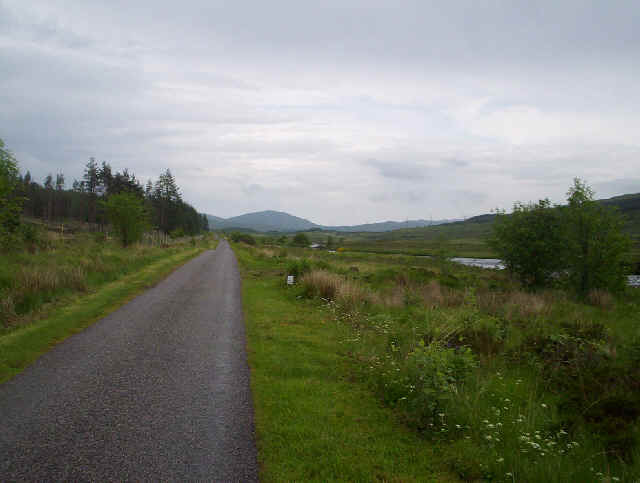 It had been a humid day and I'd drunk over a litre and a half of water, so a visit to the Inveroran Hotel was called for - a long cool orange juice restored me for the "yomp" back along the road to Bridge of Orchy and the train at 7.00 p.m. Another long day!